Damajipant was a great saint who was working and living at Mangalwedha near Solapur in Maharashtra. He used to work for the muslim king of Bidar by maintaining the stock of grains in the godown at Mangalwedha. He was very pious, kind hearted and immersed in Harichintana. His wife was equally cooperative and devoted. Once there was a great famine in that region and people, cattle died of starvation. On one afternoon, there came a brahmin at Damajipant’s door at lunchtime. Damajipant invited him to take food with him and other guests. While eating, the brahmin started to cry. When asked the reason of his sorrow, he told that his family was starving at Pandharpur, but he was eating heartlessly. Damajipant assured him that he would get lot of grains to take for his family. After lunch, he was given 2 khandi rice, which was loaded in the bullock cart to be taken to Pandharpur. On the way to Pandharpur, many starving poor people attacked the brahmin and took away his rice. When they learnt that, the brahmin had received the grains from Damajipant at Mangalwedha, a huge crowd came to Damajipant and piteously requested for grains. His wife too suggested that the poor and starving people should be helped. There was only one solution. Damajipant opened the godown of muslim king and distributed the grains freely to everyone. Soon the news spread that, Damajipant was distributing the grains and a lot of people from the areas affected by famine came. All of them received grains freely. Though all of them praised Damajipant to the skies, he remained humble However, there was one Kannada clerk working for the same king at Mangalwedha, who was jealous of Damajipant. He immediately went to Bidar and informed the king that his godown was emptied by Damajipant without informing him. The king was enraged and ordered capturing of Damajipant. The soldiers arrived at Damajipant door and showed him king’s order. Damajipant was unmoved, but requested them to take him to Bidar via Pandharpur. The soldiers agreed and they arrived at Pandharpur. Damajipant took bath in the river Chandrabhaga and went to see Lord Vitthala. There, he intently looked at the Lord and told him, that , that was the last he could be seeing Him. Tears came to eyes of Damajipant. Soldiers took him away and they started towards Bidar. Lord Vitthala, immediately disguised as Vithoo Mahar came to the king of Bidar carrying a huge load on His back. He showed a letter written in the handwriting of Damajipant to the guards who let Him in. There Vithoo Mahar entered the Durbar of the king and offered him the salutations. He introduced Himself as the servant of Damajipant and told the king that, there was a great deficiency of grains all over Mangalwedha and the adjoining areas due to famine and that Damajipant had sold all the grains for a very high price. He gave the huge bag of gold coins to the king and the letter written in Damajipant’s handwriting to the king and requested him to issue a receipt for the same. The king was astonished and immediately asked his treasury people to count the money. The money was uncountable and was in several lakhs. The king was extremely happy and felt ashamed about his wrong decision to arrest Damajipant based on a false complaint. He thanked Vithoo Mahar, issued a receipt to Him and also presented ornaments, a horse and an elephant and rich clothes to be handed over to Damajipant. Vithoo Mahar took everything and went to Mangalwedha and showed it to the family of Damajipant and disappeared. However, since, Damajipant was going to Bidar via Pandharpur he did not know anything. Some time after the departure of Vithoo Mahar, Damajipant entered Durbar and offered his salutations to the king. The king was surprised to see him again. The king came to Damajipant and hugged him with great affection and offered his apologies for his mistake. Damajipant was bewildered and looked at the king disbelievingly. Then the king told him how he had just received the money earned by Damajipant by selling the grains and so on. The king also described in minute details, the name and other features of Damajipant’s faithful servant. Damajipant immediately understood that it was the Lord of Pandharpur, who had done everything for his devotee. When tears started to roll down his cheeks, the king was surprised. Damajipant explained everything to him and told the king, that he was resigning his job, as the Lord had work for him and he did not want to trouble again. The king was surprised and praised Damajipant for his devotion. Damajipant returned to Mangalwedha and found all the gifts and the receipt at his home and told everything that had happened. He donated everything to the poor people and went to Pandharpur. He served the Lord at Pandharpur till the very end. 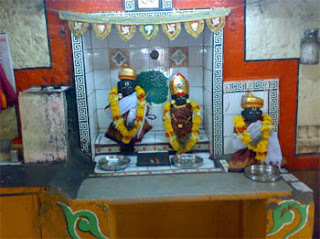 Even now there is a temple in the memory of Damajipant at Mangalwedha.